STARZ announced today the highly-anticipated first season of Neil Gaiman‘s American Gods is set to premiere on Sunday, April 30 at 9PM ET/PT. The first season of the series will consist of eight episodes. You can check out the official poster for the American Gods premiere below! The cast includes Ricky Whittle (The 100) as Shadow Moon, Ian McShane (Deadwood) as Mr. Wednesday, Emily Browning (Sucker Punch) as Laura Moon, Sean Harris (The Borgias) as Mad Sweeney, Yetide Badaki (Aquarius) as Bilquis, Bruce Langley (Deadly Waters) as Technical Boy, Crispin Glover (Back to the Future) as Mr World, and Jonathan Tucker (Kingdom) as Low Key Lyesmith. Also appearing are Cloris Leachman (Malcom in The Middle, Raising Hope), Peter Stormare (Fargo, Prison Break), Chris Obi (Snow White and the Huntsman, The Counselor), Gillian Anderson (The X-Files) as Media, Mousa Kraish (Superbad, Fast & Furious), Orlando Jones (Madiba, Sleepy Hollow) as Mr. Nancy, and Kristin Chenoweth as Easter. The plot of American Gods posits a war brewing between old and new gods: the traditional gods of mythological roots from around the world steadily losing believers to an upstart pantheon of gods reflecting society’s modern love of money, technology, media, celebrity and drugs. Its protagonist, Shadow Moon, is an ex-con who becomes bodyguard and traveling partner to Mr. Wednesday, a conman but in reality one of the older gods, on a cross-country mission to gather his forces in preparation to battle the new deities. 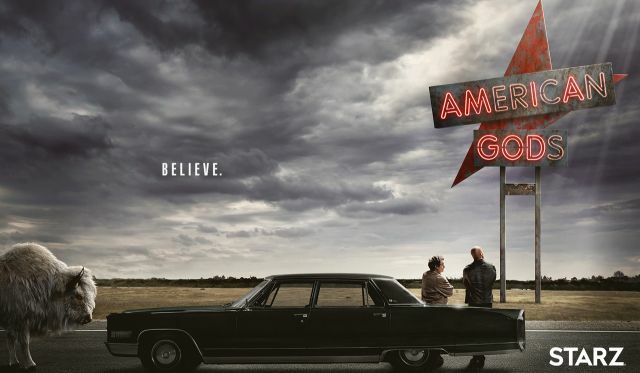 American Gods is produced by FremantleMedia North America. Bryan Fuller (Hannibal, Pushing Daisies) and Michael Green (The River, Kings) serve as writers and showrunners. David Slade (Hannibal, 30 Days of Night) is directing the pilot and additional episodes. FMNA’s Craig Cegielski and Stefanie Berk are executive producing the series along with Fuller, Green, Slade and Neil Gaiman.